Intense debate and concrete policy work is ongoing in the international community on the fiscal contribution of MNEs. The focus is predominantly on tax avoidance – notably in the G20 project on base erosion and profit shifting (BEPS). At the same time, sustained investment is needed for global economic growth and development, especially in light of financing needs for the Sustainable Development Goals (SDGs). The policy imperative is to take action against tax avoidance to support domestic resource mobilization and continue to facilitate productive investment for sustainable development. Policymakers and experts at work in the BEPS process have so far not arrived at an overall quantification of the value at stake for government revenues. Various research institutes and NGOs have put forward estimates for the amount of taxes avoided by MNEs. To date, however, there is no consensus estimate, in no small part because of the absence of a baseline establishing the actual fiscal contribution of MNEs. Furthermore, the lower a country is on the development ladder, the greater is its dependence on non-tax revenue streams contributed by firms. In developing countries, foreign affiliates, on average, contribute more than twice as much to government revenues through royalties on natural resources, tariffs, payroll taxes and social contributions, and other types of taxes and levies, than through corporate income taxes. Notwithstanding their overall role as contributors to government revenues, MNEs, like all firms, aim to minimize taxes. MNEs build their corporate structures through cross-border investment. They do so in the most tax-efficient manner possible, within the constraints of their business and operational needs. The size and direction of FDI flows are thus often influenced by MNE tax considerations, because the structure and modality of initial investments enable tax avoidance opportunities on subsequent investment income. The attention of policymakers in tackling tax avoidance, most notably in the BEPS approach, focuses naturally on tax rules and transparency principles – i.e. on accounting for income. The fundamental role of cross-border investment as the enabler of tax avoidance warrants a complementary perspective. 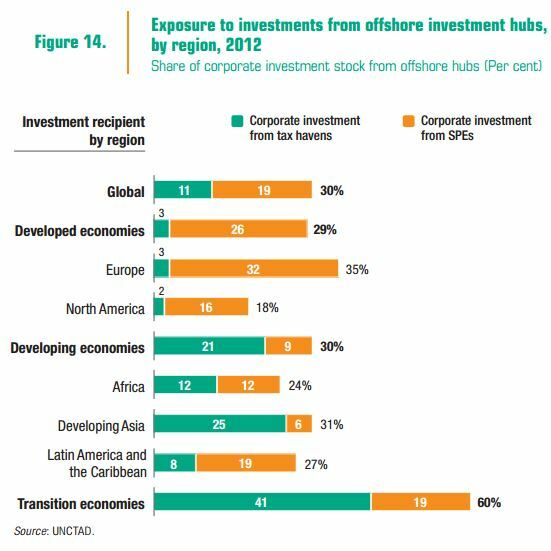 An investment perspective on tax avoidance puts the spotlight on the role of offshore investment hubs (tax havens and special purpose entities in other countries) as major players in global investment. 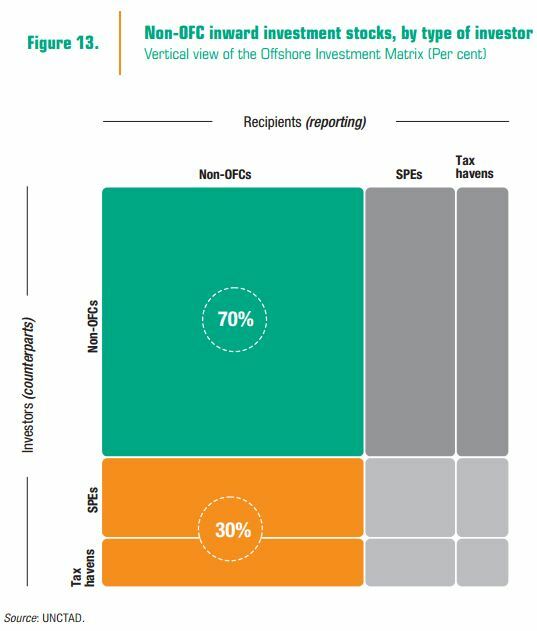 UNCTAD’s Offshore Investment Matrix shows the pervasive role of offshore investment hubs in the international investment structures of MNEs (figure 13). In 2012, of an estimated $21 trillion of international corporate investment stock in non-offshore recipient countries (coloured area in the figure), more than 30 per cent, or some $6.5 trillion, was channeled through offshore hubs (dark green area). The largest offshore investment players are jurisdictions facilitating so-called special purpose entities (SPEs). A mirror view of the matrix reveals that 28 per cent of the total amount of cross-border corporate investment stock from non-offshore investor countries is invested into intermediary entities based in hubs (dark grey area). In some cases these entities may undertake some economic activity on behalf of related companies in higher tax jurisdictions, such as management services, asset administration or financial services. Often they are equivalent to letterbox companies, legal constructions conceived for tax optimization purposes. The prominent transit role of these entities in financing MNE operations causes a degree of double-counting in global corporate investment figures. In UNCTAD FDI statistics, this double-counting effect is removed by subtracting the SPE component from reported FDI data. MNEs employ a range of tax avoidance levers, enabled by tax rate differentials between jurisdictions, legislative mismatches and tax treaties. MNE tax planning involves complex multilayered corporate structures. Two archetypal categories stand out: (i) intangibles-based transfer pricing schemes and (ii) financing schemes. Both schemes, which are representative of a relevant part of tax avoidance practices, make use of investment structures involving entities in offshore investment hubs – financing schemes especially rely on direct investment links through hubs. Tax avoidance practices by MNEs are a global issue relevant to all countries: the exposure to investments from offshore hubs is broadly similar for developing and developed countries (figure 14). However, profit shifting out of developing countries can have a significant negative impact on their sustainable development prospects. Developing countries are often less equipped to deal with highly complex tax avoidance practices because of resource constraints or lack of technical expertise. These results do not necessarily capture the full extent of MNE tax avoidance – they capture only schemes that exploit direct investment links through offshore hubs. Leaving aside the estimates for overall government revenue losses, the Offshore Indicator developed by UNCTAD provides intrinsic value to policymakers as a “signal indicator” for BEPS, and as a rule-ofthumb method for country-level BEPS impact. 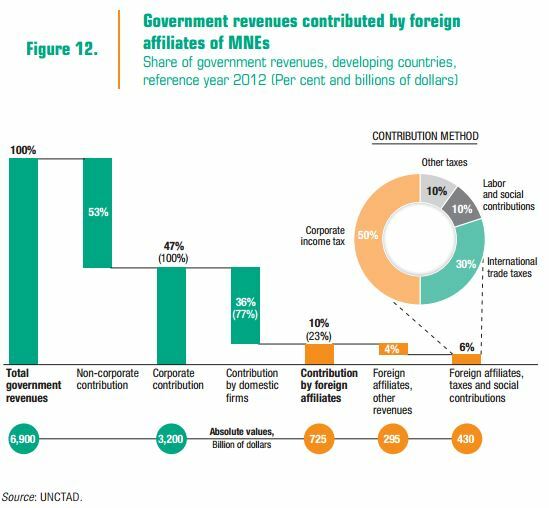 Tax avoidance practices by MNEs and international investors lead to a substantial loss of government revenue in developing countries. The basic issues of fairness in the distribution of tax revenues between jurisdictions that this implies must be addressed. At a particular disadvantage are countries with limited tax collection capabilities, greater reliance on tax revenues from corporate investors and growing exposure to offshore investments. Therefore, action must be taken to tackle tax avoidance, carefully considering the effects on international investment. Currently, offshore investment hubs play a systemic role in international investment flows: they are part of the global FDI financing infrastructure. Any measures at the international level that might affect the investment facilitation role of these hubs or that might affect key investment facilitation levers (such as tax treaties) must include an investment policy perspective. Ongoing anti-avoidance discussions in the international community pay limited attention to investment policy. The role of cross-border investment in building the corporate structures that enable tax avoidance is fundamental. Therefore, investment policy should form an integral part of any solution. 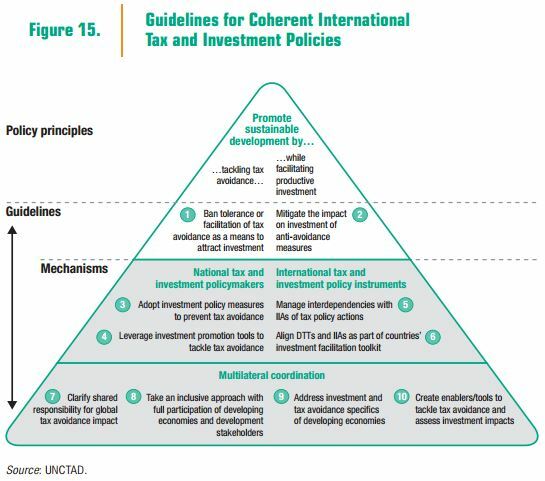 A set of guidelines for coherent international tax and investment policies may help realize the synergies between investment policy and initiatives to counter tax avoidance (figure 15). Key objectives of the 10 guidelines proposed for discussion in this Report include removing aggressive tax planning opportunities as investment promotion levers; considering the potential impact on investment of anti-avoidance measures; taking a partnership approach in recognition of shared responsibilities between investor host, home and transit countries; managing the interaction between international investment and tax agreements; and strengthening the role of both investment and fiscal revenues in sustainable development as well as the capabilities of developing countries to address tax avoidance issues.